As of 1 January 2018, ECAS is implementing a new mission-driven and free-of-charge membership, which offers access to a new package of services for our Members, both organisations and individuals. Participation in ECAS General Assembly as Governing Members (only for Organisations). For more detailed information about the free-of-charge services reserved to our Members, please contact us or consult our Membership Plan. If you would like more information about our tailor-made services, please contact huw.longton@ecas.org. Who can join ECAS’ Membership? Commercial organisations and political parties cannot be granted ECAS membership. Politically affiliated organisations can join ECAS’ network, as long as they do not involve ECAS in politically partisan activities. For more information about ECAS’ Membership, please consult Article 6 of ECAS’ Statutes at the following link. How can you become a Member of ECAS? 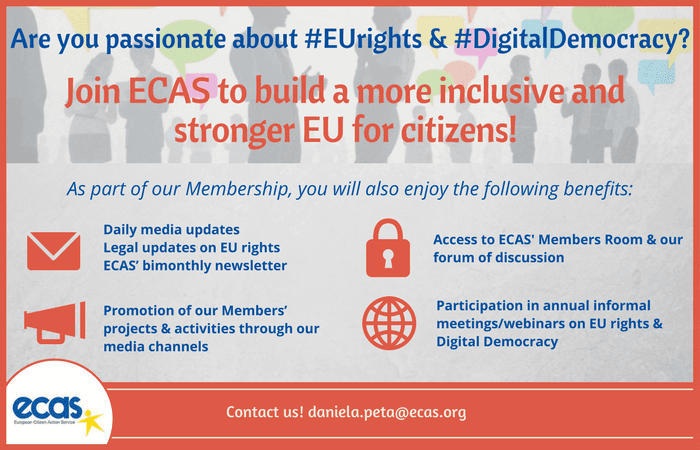 You can request to join our network of members today by filling in the membership application form available at the following link and emailing it to daniela.peta@ecas.org. Your application will be submitted to ECAS’ Board of Directors for approval and, if successful, you will receive a communication confirming your membership of ECAS.